Will Todd’s flagship work is the jazz mass setting Mass in Blue, which has been performed all around the world since its 2003 premiere. His anthem The Call of Wisdom was commissioned by St Paul’s Cathedral for the Diamond Jubilee Thanksgiving Service for Queen Elizabeth II in June 2012 and his arrangement of Amazing Grace was performed as part of the BBC Nelson Mandela Thanksgiving Service, and at the private ceremony for President Obama’s second inauguration. 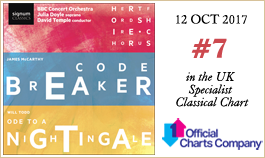 Other notable works include the opera The Blackened Man, a prizewinner in the International Verdi Opera Competition; the oratorio Saint Cuthbert, which has been recorded by the Hallé Orchestra; music theatre work The Screams of Kitty Genovese, produced most recently by Tête à Tête Opera in London and Edinburgh; a setting of Keats’ Ode to a Nightingale for Hertfordshire Chorus and the highly acclaimed Alice’s Adventures in Wonderland for Opera Holland Park. Will has worked with many of the UK’s leading ensembles including The Sixteen, the BBC Singers and the BBC Concert Orchestra. 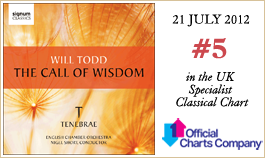 He has had a fruitful collaboration with the award-winning chamber choir Tenebrae with whom he has made the two highly acclaimed albums The Call of Wisdom and Lux et Veritas; the latter was voted one of the top 20 albums of 2014 by Classic FM. 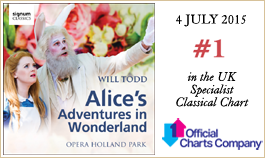 The album recorded by Opera Holland Park of Alice’s Adventures in Wonderland went straight into the specialist classical charts at No 1 in July 2015, and following three sell-out seasons of the show a new indoor production at the Linbury Theatre at the Royal Opera House, Covent Garden also sold out in November 2015. Will wrote his clarinet concerto for Emma Johnson, who recorded it with the BBC Concert Orchestra in 2015 on the CD An English Fantasy on the Nimbus label. Will has also collaborated with celebrated children’s author Michael Rosen to create Lights, Stories, Noise, Dreams, Love and Noodles, a cantata commissioned by David Hill for The Bach Choir and more recently If I Had Wings based on the Icarus myth for Herts music service for their Royal Albert Hall performance. 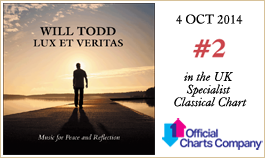 Will frequently performs as a jazz pianist, leading the Will Todd Ensemble, and enjoys a close working relationship with the chamber choir St Martin’s Voices. 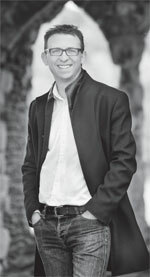 Will is a regular visitor to mainland Europe and the US where he is in high demand as a workshop leader and conductor of his own music.